Glaziers often receive enquiries relating to scratched glass, however the cause is usually found to be inappropriate cleaning of the glass. Another cause of damage to glass is the lack of protection during construction of buildings. 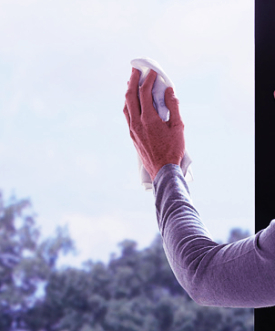 The following information outlines best practices for cleaning and protecting glass in domestic and commercial buildings. Glass should be protected from building materials during construction to prevent damage. Stains, chips and scratches can be caused by general construction dust, render, adhesives and many other substances found on building sites. Welding, floor sanding and grinding are all activities that will damage any type of glass. Protective plastic coatings, drop sheets and other sacrificial layers should be retained in position during this period. Care must be taken when working near glass as it is easily damaged under these conditions. When cleaning glass it is imperative that a clean soft cloth is used together with a quality cleaning solution to avoid damage. Stubborn materials such as paint, grease or dirt can be removed with a sharp razor, however caution should be taken as the use of a blade can cause damage to certain types of glass. If a razor is required always ensure the blade is in new condition and is held at 20-30 degrees to reduce the chance of scratching. Professional advice is recommended before using any form of scraper or blade as many modern coated or tinted types of glass must not be cleaned using this method. Other glass products that must be treated with care include reflective glass and panels that have solar film applied to one face of the glass. Always avoid using powder based abrasives and any other harsh cleaning products for any glass product. It is recommended that you do not use products that consist of Hydrofluoric or Phosphoric Acid, as they cause damage to the surface of the glass. Some cleaning products can react with the interlayer of laminated glass, therefore contact must be avoided with the edges of this type of glass. The use of a clean lint free cloth combined with a quality cleaning solution is essential in cleaning the surface of any mirror. It is important to minimise the amount of water used to clean mirrors as the mirror backing can desilver over time when subjected to these conditions. Leaving damp areas around the edges of mirrors can accelerate desilvering around the edges of any mirror. As with all types of glass the use of harsh cleaning materials must be avoided to maintain a scratch free surface.